The Secretary of State for International Cooperation and for Ibero-America and the Caribbean (SECIPIC), Juan Pablo de Laiglesia, visited FIIAPP’s headquarters and was received by its employees at an event in which he thanked FIIAPP for its work in Spanish cooperation and in the cooperation of the European Union. “As an institution, FIIAPP is a fundamental pillar in the public system of cooperation for development. 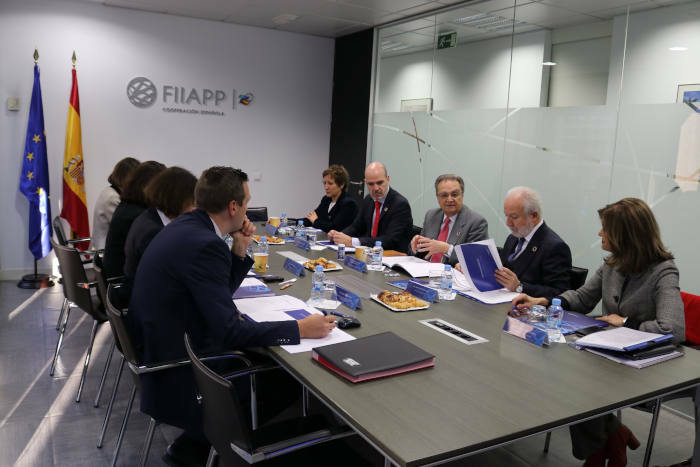 Thanks to your work, FIIAPP has become a benchmark for European cooperation“, said Juan Pablo de Laiglesia. In addition, the SECIPIC highlighted the importance of collaboration between different cooperation institutions in achieving their objectives: “The identity of the actors working through cooperation can be respected, but forces must be united so that there is coordination between the institutions”, “we need to aim for synergy between our own interests and European interests” and to “channel resources into issues that improve the linkage between international and national interests“. “We will tackle problems with increased supervision and encouragement from the Permanent Commission,” said the Secretary of State. FIIAPP’s Permanent Board of Trustees Commission has met for the first time since 2014. It was also the first time the Commission had met at the Foundation’s headquarters. At the meeting, the activities implemented by FIIAPP were reviewed along with its future prospects. For her part, the director of FIIAPP, Anna Terrón, framed FIIAPP within the Spanish and European cooperation systems and highlighted the specificity in mobilising public expertise and peer learning. Also, in her speech, she gave a brief presentation on the Foundation’s 2017-2020 Strategic Plan, highlighting its alignment with the priorities of Spanish foreign policy and cooperation. She also highlighted the twinning programmes which have been FIIAPP’s trademark since its inception. Terrón presented the new priorities for next year, focusing on gender equality, ecological transition, migration and mobility and knowledge management. The Secretary of State for Public Administration, José Antonio Benedicto, highlighted the role of FIIAPP in the internationalisation of Administrations and the mainstreaming of the 2030 Agenda in public policies. The Secretary of State for Security, Ana Botella, and the Secretary of State for Justice, Manuel-Jesús Dolz, spoke on the prioritisation of the Foundation’s activity in Latin America and in the Maghreb, West Africa and the Sahel region. The director of the AECID, Aina Calvo, highlighted the new framework for collaboration established between Spanish public sector cooperation institutions. Finally, the Permanent Commission has adopted a series of decisions on the management of the twinning programme in Spain and approved the revised version of the Foundation’s Strategic Plan and a new knowledge management programme.